Of Wiarton, suddenly at Grey Bruce Health Services Wiarton on Friday, December 5, 2014. Barbara Ellen (nee Miersch) at the age of 68 years. Loving wife of the late Cecil (October 27, 2014). 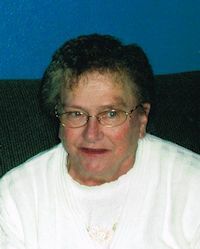 Cherished mother of Robert Scheuerman (Ann), Herb Scheuerman (Kathryn), Shelia Johns (Troy Hunter), Cathey (Scott Hutchinson), Donna Featherstone (Wayne Garrett), Barbie Scheuerman (Dan Smith), and Wanda (Charlie Miller). Devoted grandma of Carrisa, James, Danielle, Joey, Anthony, Robyn, Patricia, Jeremy, Cara, Saddie, Anna, Mabel, Gordie, Maureen, Crystal, Bridget, Tammy, and Bonnie; and great-grandma to numerous great-grandchildren. : and 1 great-great grandchild: Sister of Ken Miersch (Terri). Predeceased by her parents Fred and Harriet Miersch; her brother Ron Miersch: daughters Sharon Follis-Young, and Marlene Robinson; and son Brian Scheuerman. Sadly missed by a niece and many nephews. Friends may call at the Thomas C. Whitcroft Peninsula Chapel, 272 Berford St., Wiarton (519) 534-5341 on Sunday, December 7 for visitation from 2-4 PM. A service to celebrate Barb’s life will be conducted from the chapel at 4 o’clock. Cremation has taken place. Donations to the Canadian Diabetes Association, Kidney Foundation, and Ontario Heart and Stroke Foundation would be appreciated.